New concept art and plans have been announced by Turner Asia Pacific and Indonesian real-estate and hospitality investment company, The MAJ Group for a new 4.3 hectare Entertainment Park and waterpark in Bali. 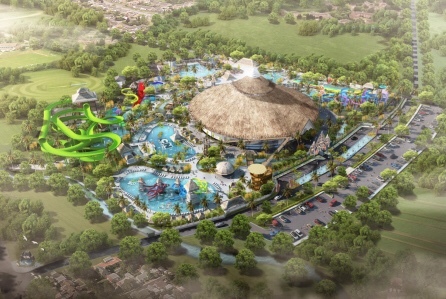 The new park will open by 2020 and will be the largest entertainment complex and waterpark in Bali. It’s not the first Cartoon Network themed park, as the network famous for Power Puff Girls, Adventure Time, and Stephen Universe has Parks and attractions already with Cartoon Network Amazone in Thailand, IMG Worlds of Adventures in Dubai, Amaazia in India, and Cartoon Network Wave cruise liner in Asia Pacific. No list of attractions yet, but attractions based on Ben 10 and other Cartoon Network staples are already in other locations. IMG Worlds of Adventure in Dubai bringing Marvel, Cartoon Network and Dinosaurs to life this August!